On December 4, 2013, the Day of the Presentation of Our Lady to the Temple, after the Divine Liturgy at the Cathedral of the Assumption, His Holiness Patriarch Kirill of Moscow and All Russia presented high church awards to some executives of the Presidential Administration, at the Patriarchal chambers in the Moscow Kremlin. Mr. Yu. 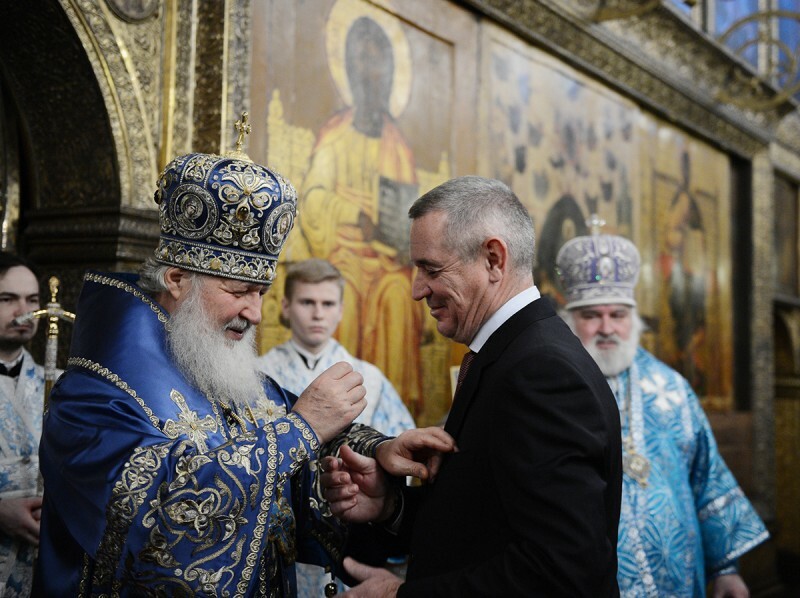 Ushakov, Presidential assistant, and Mr. A. Manzhosin, chief of the Presidential Directorate for Foreign Policy, were awarded the Order of St. Seraphim of Sarov (2nd degree). Mr. V. Nazarenko and Mr. F. Ilyichev, deputy chiefs of the Directorate, were awarded the Order of St. Sergius of Radonezh (3d degree). Mr. D. Agafonov, head of a department in the same directorate, was honoured with the Medal of St. Daniel of Moscow. These high church awards were granted on the proposal of Metropolitan Hilarion of Volokolamsk, head of the Moscow Patriarchate’s department for external church relations, in acknowledgement of the awarded officials’ work for strengthening peace among nations and for their long-standing cooperation with the Russian Orthodox Church and on the occasion of the 15th anniversary of the Presidential Directorate for Foreign Policy. Congratulating the awarded officials, Patriarch Kirill pointed to their outstanding services to the Motherland and the high level of cooperation between the Directorate and the Department for External Church Relations, which began when His Holiness was appointed as chairman of this Department of the Russian Orthodox Church. His Holiness expressed hope for further fruitful cooperation and wished all the participants in the gathering God’s help and sound health and gave them his primatial blessing.